With 64 impeccably designed villas and suites, Taj Exotica Resort & Spa, undoubtedly is in the top range of Maldives luxury resorts. But even in thisexclusive group is getting crowded, and there is a sense in the unique offerings that this resort successfully offers better than anyone else. It is here, indeed sublime aspects of the Taj hotel chain - it's fine cuisine and a spa. Individually in the top 3 or 4 in the country, in the bosom of the Taj there are compelling arguments to make you to fly half the way around the world. Another advantage, though not quite unique is that the resort is just a 15-minute luxury speedboat ride from Male airport. 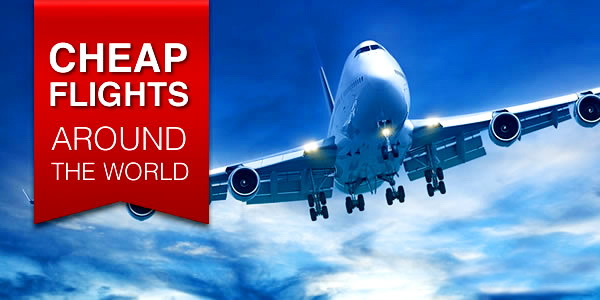 This proximity also includes a special tour by seaplane, and easy access to Male metropolis for historical sightseeing tour. Casting an east flavors that really him to the face, Taj Exotica Resort & Spa has been full renovated in 2008, and today this piece of paradise offers luxury, quiet and a great value. A huge shallow lagoon sparkles with shades of turquoise which immediately raises the mood and simultaneously soothes. In the heart of this amazing seascape is an emerald of vegetation in a rim of soft white sand - Emboodhu Finolhu Island. So narrow that you can often see water from both sides when you walk along the path. Located on a private island in the northern corner of South Male Atoll, the hotel can be reached by a 24-hour speedboat ride directly from Male Airport. In a country where most islands require an additional seaplane transfer, a 15 minute boat trip to the Taj Exotica is extremely convenient. 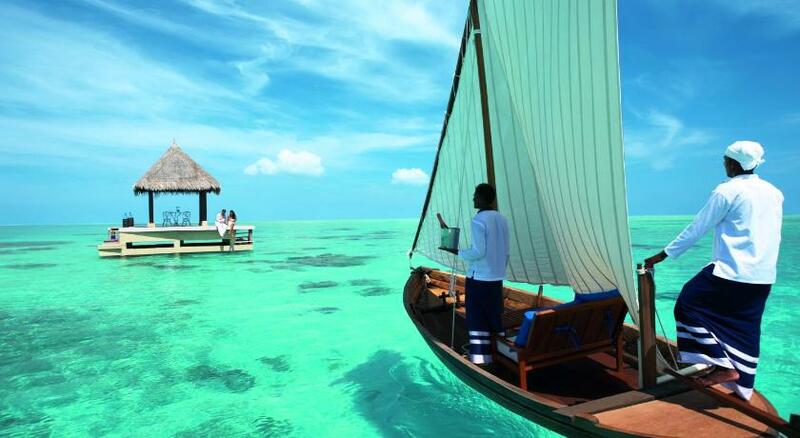 Surrounded by 200 acres of blue waters, the island is home to one of the largest lagoons in the Maldives. The hotel staff, approximately 220 souls, lives and works in the resort full-time. A walking tour of the island takes about 10 minutes. Embraced with soft white sand beaches and warm water aquamarine, Taj Exotica luxury style perfectly complements the natural beauty of the island. 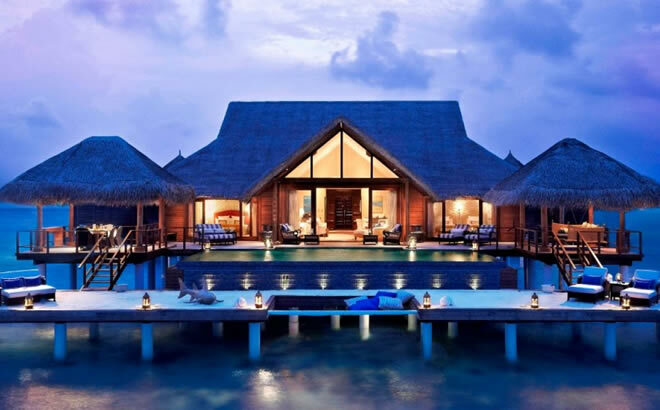 The resort has 56 Water Villas and 8 Suites: 24 Lagoon Villas, 21 Deluxe Lagoon Villas, 10 Deluxe Lagoon Pool Villas, and 1 Rehendhi Presidental Overwater Suite with Pool. All these luxurious cocoons differ in size and detail, but have the same design. Rich and refined style, but still not a palace. 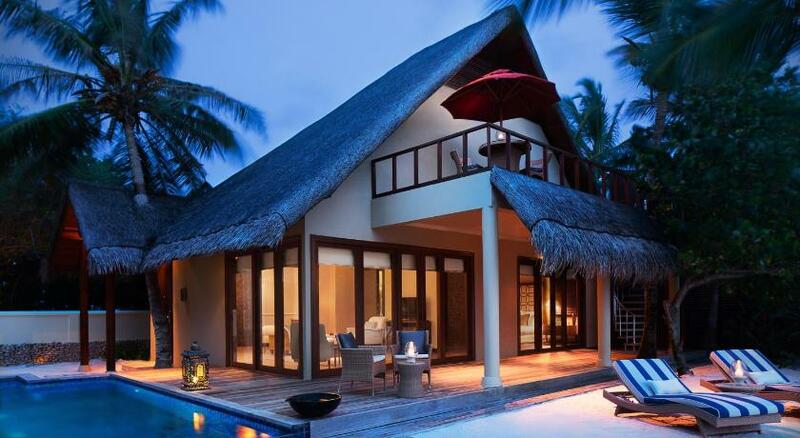 All villas are air-conditioned, all under palm leaves and trimmed with natural wood. 55 villas over the water, while the rest are scattered on the beach. All rooms are fully equipped with minibar, satellite TV, DVD player, telephone, Nespresso coffee machine, private outdoor pool, butler on call and bath with sea view. Inside the room you will also find sunscreen, and one-time underwater cameras. The marble bathrooms are equipped with a rain shower, separate bathtub with ocean view, + bathrobes and all toiletries. Some villas offer gardens, private beach areas, verandas with sun loungers and direct access to the surrounding lagoons. The rooms have free Wi-Fi. The fabrics of warm natural tones and walls compensate for the formalities of the decor and a teak wood furniture. The first of Lagoon Villas is affected by sounds and views of the service area, and a number of villas in the lagoon overlook Male City lights on the horizon, but the other views have no limit. Everywhere is dominated by natural materials and ethnic home decorations, from wicker mats to precious woods, marble, rare ... making rooms capsules of exquisite luxury. The shades are dominated by blue, green and orange colors. All bathrooms can accommodate a bath that can easily be argued with the greatness of the lagoon. A serious blow for the heart is expected to be found in four Deluxe Beach Villas, including the magnificent teak terraces around the pool with a hammock, day bed and shady surrounding vegetation all together invite to luxurious laziness with absolutely turquoise infinity opposite. 8 Beach Villas offer extra space, an external shade and a large pool with a sundeck to 3 sides and a beach on the other. 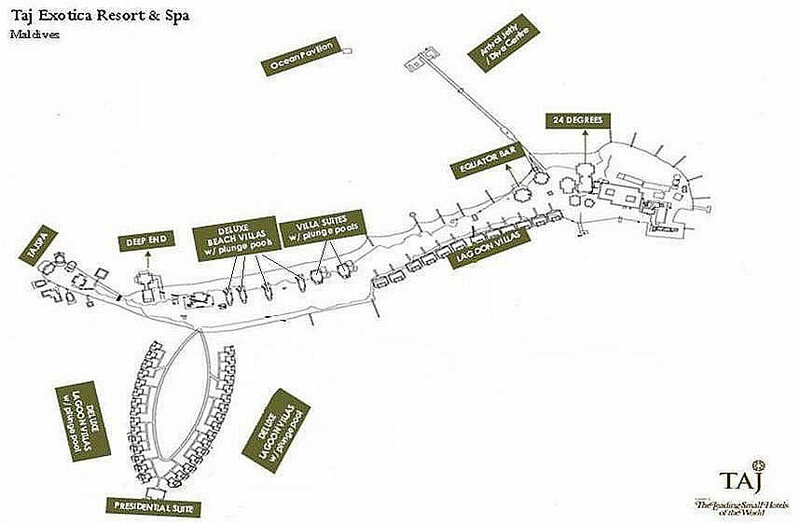 The interior of the beautiful campfire is entwined with a network of paths, although guests can also walk along the beaches around the island. The main beach is wide, white and inconspicuously slopes into a stunning lagoon. Connoisseurs of the beaches may notice that there is not always very soft sand here that the Maldives can offer. Along the white sandy beaches you can often see curious herons, as well as rays and colorful fish in the lagoon in shallow water. All rooms have air conditioning, bathrooms with Molton Brown toiletries, double sink, bathtub with ocean view and separate rain shower, hairdryer, safe, WiFi, satellite TV, media center with DVD / CD player and MP3 station for iPod, tea and coffee making facilities and a private butler. Each room has a butler service. Butlers, in fact act as personal assistants and help organize excursions, carry luggage, make a warm aromatic bath, and so on. While the resort is focused mainly on couples, babysitters and activities for families are available for an extra charge. Children can play beach volleyball, ride water bicycles, participate in canoe racing, try kid's yoga, or even enroll in classes of "young bartenders." The resort also provides free Wi-Fi, daily feeding of sharks and rays, and (on request) personal photo sessions. 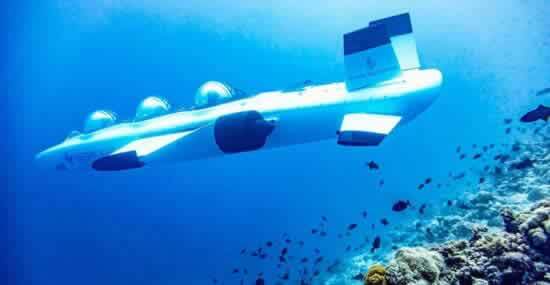 A number of excursions, including diving on a submarine, Male tours, watching dolphins and seaplane flights. 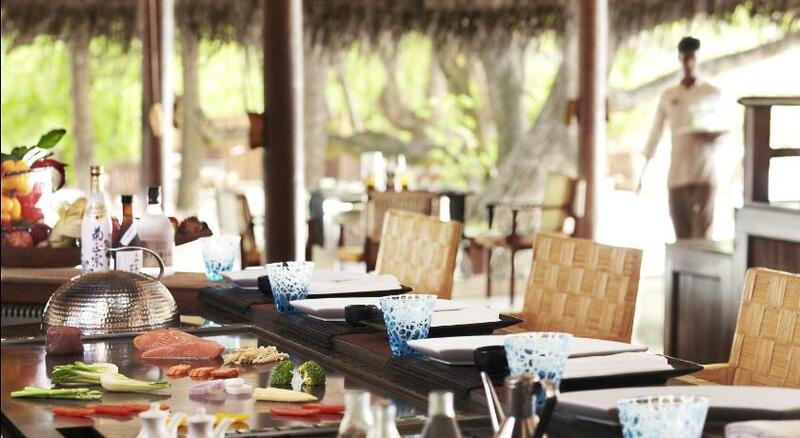 As for the food in Taj Exotica, you will be spoiled for an appetizing variety. The Deep End restaurant is all on the theme of "progressive world cuisine" in a delightful, partly alfresco setting right over the water. This is the only restaurant in the country that was featured in the 'Hot Tables' Conde Nast magazine. The resort's sommelier is ready to present a large list of wines, where there is something to lean on, given its recommendations, and also specially organized wine tastings on vineyards all over the world. All daily dishes in Deep End from the A La Carte menu (as desired). For presentation purposes and freshness of food the only way to assess the chef's talent and skills is to order a seafood dish. Or, if you have any dietary preferences, chefs will have it in mind. The dining options are endless. Berry souffle is what you must try for a dessert! If you want a banquet of lobsters for dinner, just hint about it at lunchtime. To enhance the romantic atmosphere the restaurant is so dim that guests are given flashlights to read the menu for dinner. The medium bill for two is approximately $ 250. The best tables on the edge of the terrace, under the stars overlooking the lagoon. The restaurant is open from 19: 00-22: 45. As for the dress code probably ... dress more decently. Good news for Epicureans, 5 days a week for dinner in the 24 Degrees restaurant has a theme buffet . Expect a banquet of seafood, shish kebabs in Maldivian style, as well as a delicious variety of Indian, Pan-Asian, and international dishes. The average bill for two is usually $ 160, and the restaurant is open for breakfast, lunch and dinner from 07: 00-22: 45 with breaks for snacks. The best tables are located right on the beach overlooking the "sapphire" of the lagoon. The Equator Bar is one of the most promising in the country. The cocktails list is as diverse, inventive and thoughtful as his culinary offerings. Here you will also find good liqueurs, whiskeys, cigars, hookah and of course stunning sunset views. Open from 16:00 until midnight. 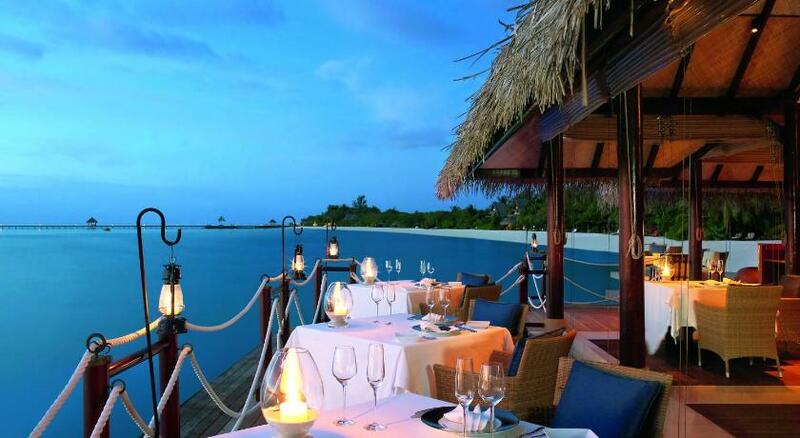 For an additional fee, this resort also offers private romantic dinners in an exclusive setting (in the treetop, on a sandbank, or on a floating platform in the lagoon) with a wicker menu and impeccable service, or even order pizza, you will not believe - with black caviar and gold leaf topping. Many guests do not refuse to eat in their villa, using the 24-hour room service. Unfortunately, the massive shallow lagoon means that there is no snorkeling, not to mention the house reef in Taj Exotica, and there is no access from the beach to the edge of the reef. This heavenly place is really a getaway for couples and honeymooners. The resort provides a transfer to the pontoon anchored at the edge of the reef, but it's much better to go to another reef for excellent snorkeling. Nevertheless, if resort's guests miss something in snorkeling, this defect is compensated by the fun diving. A big game fishing can be organized, but basically the main excursions are private sunset or under the stars cruises, and for Exotica a beautiful island is essentially a slow, quiet place where romantic couples try to hide in their own space. From massage to manicure, Jiva Grande Spa is a premium sanctuary of Taj group with roots deeply rooted in the foundations of Indian philosophy with holistic treatment, exercises and diets. Doctors of Ayurveda give effective recommendations that can be strictly Ayurvedic, for specific conditions or aimed at relaxation, detox and beauty. Yoga and meditation are taught in the overwater glass room not far from the spa, that really looks great - with a thatched roof and sea views, and surrounded by flower gardens. Taj Exotica is an island of modest size, but it still offers many worthy facilities. A modern, overwater fitness center provides visitors with beautiful ocean views. Leisure facilities include a cozy playroom with a pool table, chess and board games. The resort also has a stylish souvenir shop and a multilingual library with two computers. Children in Taj Exotica are not prohibited, but for families there are no facilities and services. 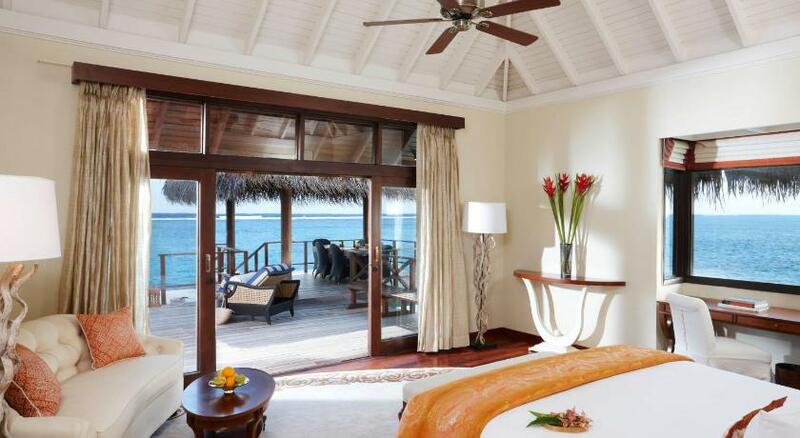 For sensual pleasures, the Taj Exotica Resort & Spa is the best choice. Nearly every past guest raves about every aspect of their holiday, from the villas to the setting to the service to the dining. The staff also gets quite a lot of attention, with nearly everyone agreeing on their professionalism, great service and helpful attitude. Few other 5-star private-island resorts in the Maldives can match the praise, making this one of the best and most reliable choices for a honeymoon or any other tropical getaway. Considering the exellent location and price range, which is actually quite reasonable for this level of service and these facilities, the Taj Exotic Resort does amazingly well with reviews, so it appears to be a solid value, among all its other qualities. Delicious breakfasts and the variety is certainly impressive; a quality food is a top level! Beautiful Spa and a fun diving; Relax by one hundred percent. 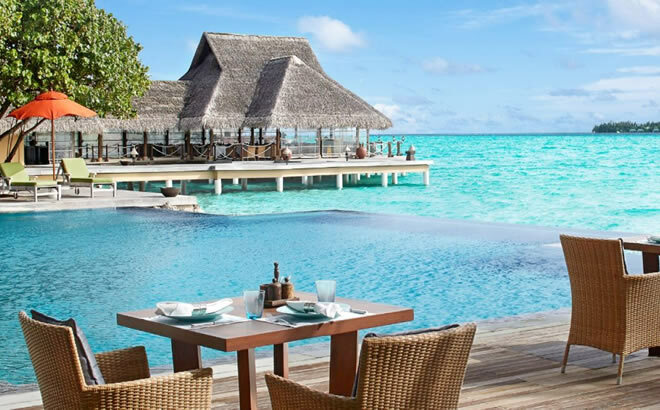 All dining options in the Taj Exotica from a la carte menu, without a buffet. A berry souffle is something that you should not miss on a dessert! If you need a good beach, a spa and diving to choose a place for a honeymoon, then you are here! 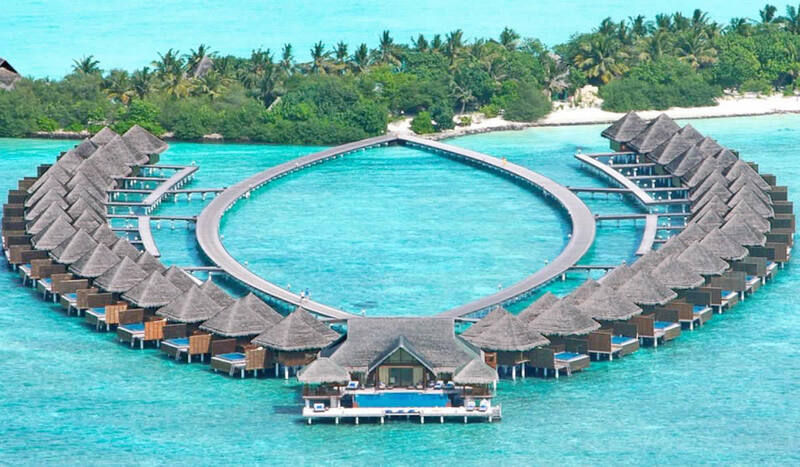 Taj Exotica is on an island with one of the cleanest lagoons in the Maldives, Emboodhu Finolhu. The majority of clients are British, Indian, Korean and Japanese newlyweds.